A multiple card, flip stand version of our wire sculpture series. 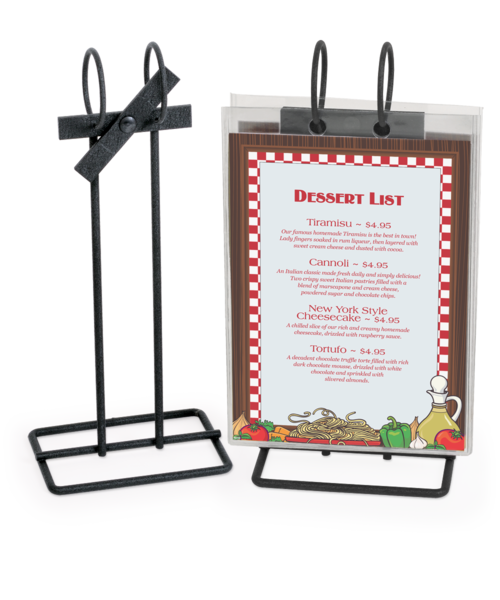 Black Powder Coated steel stands 10 in. tall, with a small 3 in. x 4 in. footprint and weighs a hefty ½ lb. Ideal for windy, outdoor patio or poolside tables. Rings at top are 1 3/4 in. in diameter and can hold up to 12 cards with a swing clearance of 8 in. to the base. Pivot bar at top is permanently attached to stand with eyelet and swivels open and closed so you can easily load or remove pockets or cards, then lock them firmly in place. Clear vinyl pockets are available to hold 4 in. x 6 in. or 5 in. x 7 in. cards. Pockets with two holes to fit these stands are available in two sides. Click here to order. 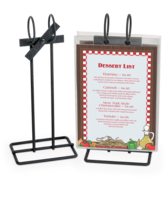 A multiple card, flip stand version of our wire sculpture series menu holder. Shop online with the Menu Shoppe today.